LSS is pleased to announce that legal aid services will not be disrupted starting next week after all. Lawyers who do legal aid have voted to accept a bargaining incentive payment from the Ministry of the Attorney General and Legal Services Society to prevent a withdrawal of lawyer services. This is good news for the many people who rely on legal aid. The offer was made possible with a $4 million contribution from government and $3.9 million from LSS. The $7.9 million total will be used to increase payments to lawyers for several months, during which time the Association of Legal Aid Lawyers, LSS, and the ministry will negotiate a framework for a future increase in payments beyond the end of October. Lawyers do valuable work on behalf of legal aid clients and have had only one increase in pay since 1991. To find out more, see our announcement on the LSS website. As content changes are minor, the Aug 2017 edition will still be available until stock is gone. Effective October 30, 2018, the Legal Services Society will implement a new limited representation contract for a trial period, where counsel may provide unbundled services to clients with financial security issues, including child and spousal support and preservation and/or division of family property. The contracts are intended to provide clients with the assistance necessary to effectively negotiate a settlement or represent themselves. Limited representation contracts will include up to 15 hours preparation, including limited court-based case conference attendance. Unbundling legal services, where counsel provide legal services for part of a client’s legal matter, allows clients to access some legal help where they would otherwise not be eligible for legal aid representation. The Legal Services Society (LSS) has increased the financial eligibility guidelines for child protection services. This is to improve the accessibility of legal aid when a child has been removed or is at risk of being removed from their home by the Ministry of Children and Family Development. LSS provides lawyers to about 2,300 people with child protection cases each year. With its severe consequences on families, LSS is hoping the higher income cut-off will mean more people get a lawyer’s assistance when there are concerns that a child is in need of protection. The financially eligibility guidelines for child protection (CFCSA) matters have increased by $1000 for each household size. The change became effective as of September 27, 2018. See the new income chart here. By increasing the guidelines, LSS now has consistent financial eligibility criteria for all its child protection representation services, including LSS’s Parents Legal Centres. With new funding from the provincial government, the Legal Services Society (LSS) is now able to help more people who have family law problems. LSS has reinstated family law coverage that it had to eliminate over a year ago when money for discretionary spending ran out. The following policy changes may help one of your clients. Under the Exception Review process, LSS will review the application of a financially eligible person whose legal problem does not meet our family coverage guidelines. The purpose of the review is to determine if there are circumstances that may warrant appointment of a lawyer for the person. The factors LSS will consider depend on the circumstances of the individual case, but are generally situations where appointment of counsel is needed. Sometimes a legal aid applicant meets the coverage guidelines for family law representation but does not meet our financial eligibility guidelines. Discretionary financial coverage for family cases means LSS will take a more generous approach to determining if a client is eligible for legal aid. Note that it is for applicants who are only slightly over the financial eligibility guidelines and have a serious, complex case. Under the Extended Family Services process, LSS can grant a lawyer more hours for a client whose primary legal issues require more time than was specified in their original legal aid representation contract. If you are working with a client whose lawyer is nearing the end of the available hours in the representation contract, consider asking the lawyer to apply to LSS for Extended Services (it must be the lawyer, not the client, who applies). If you have questions about whether these changes could help your client, please call 604-601-6000 and ask for Sarah Khan or Branka Matijasic. We’ve revised and reprinted If You Can’t Get Legal Aid for Your Criminal Trial. This booklet is for people facing serious and complex criminal charges who’ve been denied legal aid and can’t afford a lawyer. The booklet includes a checklist of points to cover in court and copies of the necessary court forms, with instructions on how to complete them. Note that the French version of this publication does not include the recent changes that are in the English version. The poster lists Legal Aid contact numbers and websites, directing people to free legal help. Surrey Parents Legal Centre now open to help people with child protection matters! The Parents Legal Centre (PLC) is a Legal Services Society (Legal Aid BC) service to help eligible parents, or people standing in the place of a parent, with child protection matters. The PLC offers early intervention in dealing with the Ministry of Children and Family Development or a Delegated Aboriginal Agency. PLC lawyers provide legal advice and representation at collaborative processes or at court, and PLC advocates provide support throughout the process, as well as help accessing community resources and agencies. The Vancouver PLC is located at Robson Square Provincial Court to help clients from Vancouver and Burnaby and has been operating since February 2015. If you have any questions, please contact the Surrey PLC at 604-595-4360 or the Vancouver PLC at 604-601-6310. We redesigned the Legal Aid in BC website bookmark to reflect recent changes to the LSS website homepage. The bookmark lists the legal issues covered by Legal Aid and includes how the site can help you. Thanks to discussions between the federal and provincial governments, the Legal Services Society has received a commitment for additional immigration and refugee funding that will ensure the continuation of services through the end of our fiscal year (March 31, 2018). Earlier this year, continuation of these services was in question due to a lack of funding to keep up with the increased demand. We would like to thank everyone who took time to bring this important issue to the attention of elected officials, the media, and other influential organizations. Your efforts made legal aid and refugees a topic of public debate and have helped the Legal Services Society get additional funding to help those who are most in need of assistance as they try to start a new life in Canada. The two levels of government continue to discuss funding for the 2018/2019 fiscal year. LSS has provided them with an analysis of the anticipated demand for immigration and refugee services, which indicates that a significant increase to our funding will be needed to provide these services for the entire year. We’ve reprinted the English version of our Legal Aid Can Help You brochure with minor revisions. This plain language brochure is also available in print and online in Chinese (Simplified and Traditional), Kurdish, Punjabi, and Spanish, and online only in French. These language versions don't include the most recent changes and updates that appear in the English version. Previous versions should be recycled. The brochure outlines legal aid services and what kind of help is available by phone, in person, and online. It also lists all legal aid locations in BC with the phone numbers. The Legal Services Society has received confirmation that the federal government will provide additional funding to ensure continued legal aid services for immigrants and refugees. LSS announced last month it would stop taking applications for immigration and refugee services effective August 1, 2017, due to a lack of funding to keep up with increased demand. The new funding allows LSS to maintain services until November 2017 and federal-provincial discussions regarding immigration and refugee legal aid in BC are concluded. The need for increased funding is the result of the global refugee crisis, which resulted in a 145 percent increase in legal aid refugee cases at LSS over the past three years. The new funding is necessary at this time because LSS, unlike other legal aid plans, cannot reallocate funding from other services to cover a deficit in immigration services. Effective August 1, 2017, the Legal Services Society will no longer accept applications for immigration and refugee cases due to a lack of funding. The global refugee crisis has resulted in a 145 percent increase in refugee cases over the past three years. Funding for refugee services, which is provided by the federal government, has, however, not kept up with demand. LSS must stop issuing new contracts for immigration and refugee services on August 1 to ensure it has enough money to pay for those contracts that have already been issued. For more information see our FAQ. The next time you visit the LSS website homepage, you’ll notice a new look. We’ve added more visual elements to help you find what you need. Our user-focused changes include entry points based on the legal issues LSS covers (Family, Children/MCFD, Criminal, and Immigration). When you click the button for an area of law, you’re directed to relevant services. We’ve also made our Call Centre phone numbers more prominent for people who want to apply for legal aid. Other changes include an Updates section to accommodate more of our stories and news items, and more prominent links to our other sites. And at the bottom of the page, you’ll find links to our three core services: Information, Advice, and Representation. We hope you like the updated look and find the changes improve your website experience. If you’d like to let us know what you think, you can either complete the popup survey that may appear when you enter the site or email your feedback to us. 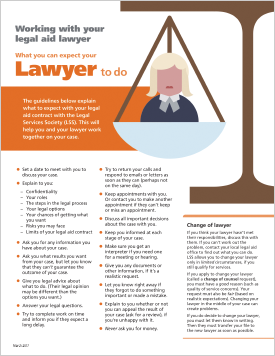 Our new Working with Your Legal Aid Lawyer fact sheet replaces What You Should Expect from Your Legal Aid Lawyer. Through a creative new design, we present the roles and responsibilities of the client and the legal aid lawyer in a balanced way. With these guidelines, clients and lawyers will know what to expect from a legal aid contract. Knowing each other’s roles and responsibilities will help clients and lawyers work together on the case. 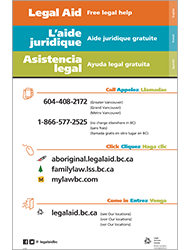 The redesigned Legal Aid poster has a bright, new look and an updated layout that includes three languages. This version includes English, French, and Spanish. We’ll be producing additional versions in other languages (plus English). The poster lists Legal Aid contact numbers and websites, directing people to free legal help. This post originally ran on the Legal Services Society website; you can find it, and more stories about day to day life in legal aid in the Our Stories section. From her office in Golden, BC, lawyer Amber Van Drielen helps people from across BC with their family law problems. “I can remember the audible sigh of relief from a client on the other end of the line once she realized she might be able to obtain spousal support and pay her rent,” Amber said. As lead lawyer of the Legal Services Society’s (LSS) Family LawLINE phone service, Amber and 12 other contract lawyers provide legal advice services to people with low incomes from their own offices around the province. It's just one of the innovative ways LSS connects British Columbians to legal aid. Family LawLINE clients often live in rural areas at significant distances from other services, and their legal matters may be complicated by other issues, such as health concerns and lack of funds for transportation or photocopies necessary for court appearances. Although the phone line has been around for a while, it was expanded to include more services with pilot project funding until 2017 from the BC Ministry of Justice. Since the full model went into effect, LawLINE has been able to help over 1,800 people (April 1 - October 31, 2015). It is difficult to say who a “typical” client is for the Family LawLINE. There are those with last-minute urgent issues. For example, the client who has already purchased tickets for international travel with her children only to find out that there is a problem at the passport office because the other parent won’t sign the paperwork. Or the other parent refuses to sign the travel consent. There are also the clients that need — perhaps for a medical reason — to request an adjournment of a hearing or trial at the last minute. In these types of last-minute stressful situations, Family LawLINE services are greatly appreciated. Then there are clients who have recently separated. This is a perfect time to speak with a family lawyer. I am able to review with the client their legal position and options. Often clients may need to vary an existing court order or they are on the responding end. I recall assisting an elderly client who was responding to an application to terminate her spousal support in the Supreme Court. Over the course of a couple of consults, we worked together on her response. I sensed as we worked on the matter together that she found a new sense of confidence in her ability to respond and deal with the action. Overall, working with clients on the Family LawLINE is an interesting and rewarding experience. For more about the service, read the Enhanced Family LawLINE fact sheet.